Cedarburg High Schools students are very involved in the Cedarburg PAC, Inc. operation. They spend time learning about the inner workings of a performing arts center. They work in the box office meeting the ticketing needs of our audience and on the tech crew learning about the “behind the scenes” component of the performing arts. And, they participate in learning opportunities with our visiting artists. Cedarburg PAC, Inc. master classes and workshops bring artists and students together in unique learning and practice experiences. Artists display their talents and provide tips and techniques to help students hone theirs. Some artists have highlighted the budding talents of students by welcoming them on stage during their Visiting Artists Series performances. A dream come true for these students! Some of our visiting artists have conducted Q&A sessions during open sound checks allowing students to observe how artists and their crews prepare for a performance and ask their many questions. This process can be very motivating for students. And, it’s a wonderful way to get young people more involved with the arts. 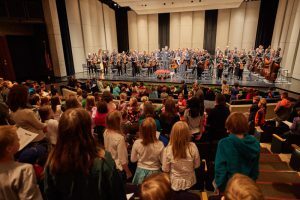 This past season, the Milwaukee Symphony Orchestra, with underwriting from the Rita Edquist Memorial Fund, provided another fun and inspirational holiday performance for local students – from grade school through high school. NBC’s The Voice finalist Chris Mann collaborated with students during his Visiting Artists Series performance. He sang several songs with the high school’s 24-member A Cappella Choir. One of America’s foremost musical ensembles, Dallas Brass, offered a clinic for middle school and high school band students prior to their CPAC performance. Then, they invited the 72-member high school Symphonic Band to play with them on stage during their concert. Additionally, Commercial Art & Design students from Cedarburg High School partnered with the Cedarburg PAC to create posters promoting student tickets for Visiting Artists Series performances. Cedarburg High School students work closely with the Center’s staff and committee members in a variety of areas including: event management, hospitality, merchandise sales, digital promotion, etc. There are also continuing opportunities for students to work in the box office and participate on the technical side of our productions. These experiences give students the opportunity to experience every facet of the performing arts. This allows young people to understand and appreciate the arts. And, it helps students decide where their interests lie and what avenues they have for pursuing their performing arts related dreams in the future.